The 3-D Video Viewfinder was developed by Steve Hines to provide valuable depth information when shooting 3D. Color monitors show objects floating off the screen, or breaking frame lines. By using the remote control with the 3-D Video Viewfinder, the StereoCam™ can be adjusted until the shot works. The image of the video is at an apparent 60-foot distance. 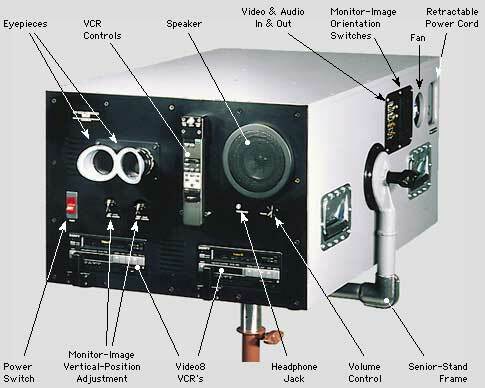 A silhouette of the front row audience is 28 feet closer, provided as a depth reference for images that come off the screen, and motion parallax as the viewer moves within the oversize eyepieces. moves within the oversize eyepieces. 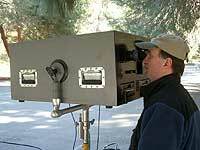 Bob Gothro, director of “Dreamchaser” monitors a shot in Los Angeles, Aug.
Switches on the right side allow either image to be vertically flipped, or horizontally flopped, therefore the “Left” image from the StereoCam, which sees a reflected image off the beamsplitter appears correct and upright. The 3-D Video Viewfinder is also a valuable post-production tool, allowing edited L&R film to be transferred to tape for previewing in 3D before printing. The 3-D Video Viewfinder is designed as part of the StereoCam dual-camera 3-D motion picture rental package; however, is available with the HinesLab BiClops and Iwerks 870/1570 3-D rig. The 3-D Video Viewfinder is also a valuable research tool for training, 3-D arcade-game developers, for schools doing studies in visual perception, for use by hardware engineers in determining depth perception requirements of head-mounted virtual-reality goggles, etc. It certainly impressed me on the 3D project, my first, that we did. Marty Mullin, 3-D DP.